The controversial weed killer ingredient glyphosate will be added to California's list of potentially cancerous chemicals effective July 7, state officials announced Monday. Glyphosate is the most widely sold herbicide ingredient in Canada. The controversial weed killer ingredient glyphosate will be added to California's list of potentially cancerous chemicals effective July 7, state officials announced Monday. 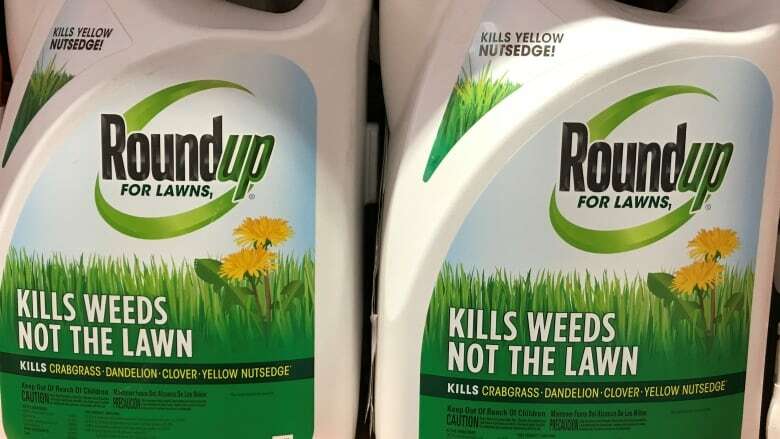 Glyphosate is the most widely sold herbicide ingredient in Canada, and it's the key ingredient in Roundup, the most widely used weed killer in the world. The move makes California the first state to take a step toward requiring Roundup to come with a warning label. Roundup's maker, Monsanto, vowed to continue its legal fight against the designation, and called the decision "unwarranted on the basis of science and the law." The seeds and chemicals company has faced increasing litigation over glyphosate since the World Health Organization's International Agency for Research on Cancer said that it is "probably carcinogenic" in a controversial ruling in 2015. The WHO stepped back its position somewhat in 2016, saying glyphosate was "unlikely to pose a carcinogenic risk to humans from exposure through the diet." "This is not the final step in the process, and it has no bearing on the merits of the case. We will continue to aggressively challenge this improper decision," Scott Partridge, Monsanto's vice-president of global strategy, said. Listing glyphosate as a known carcinogen under California's Proposition 65 would require companies selling the chemical in the state to add warning labels to packaging. Warnings would also be required if glyphosate is being sprayed at levels deemed unsafe by regulators. Monsanto tried unsuccessfully to block the listing in trial court, arguing that Roundup doesn't cause cancer and that the labels will harm the company's business. Environmental groups cheered OEHHA's move to list the chemical. "California's decision makes it the national leader in protecting people from cancer-causing pesticides," said Nathan Donley, a senior scientist at the Center for Biological Diversity. Glyphosate has no color or smell. Monsanto introduced it in 1974 as an effective way of killing weeds while leaving intact its "Roundup ready" crops and plants, which were genetically modified to be resistant to the herbicide. It's sold in more than 160 countries, and used on 250 types of crops in California. It's also used in landscaping, golf courses, orchards and vineyards. In Canada, glyphosate is sprayed on crops such as canola, soy, field corn and wheat. According to a report by Health Canada's Pest Management Regulatory Agency obtained by CBC News, more than 25 million kilograms of glyphosate were sold in Canada in 2014 (the most recent year for which data is available), where it's sprayed on crops such as canola, soy, field corn and wheat. Earlier this year Health Canada published its re-evaluation on glyphosate, saying the potential risks to human health and the environment from the chemical are acceptable if used as directed, but it also ordered manufacturers to update commercial labels for products containing glyphosate by 2019.